Seems as though I find myself respecting people who have lived their their life with an attitude of gratitude. They serve as a constant reminder to me that not all learning is easy (most is not), but with the proper mindset a person can overcome, learn, and be an example for someone else; being grateful for not only the good times, but also the challenging and more often the difficult times. William David Burford, my father, is one of those whom I respect the most. Even though we don’t live close by one another, we talk or text almost every day. Some days are about nothing really at all, and others are moments that shape my life. But a constant thread runs through our conversations, and that is while striving to do better and be better always be grateful and thankful for what you have and where you are RIGHT NOW. He brought that very point ‘home’ on Christmas morning this year. “When I was growing up Mom and Dad always made sure we went to church on Christmas Eve. They didn’t go, but they made sure we got there. Before we left for home, each child received one of these bags as a Christmas gift. It wasn’t much, but it was to us back then (in the coal-mining town of Edwight, West Virginia. The town no longer exists. After the coal mines were shut down, the company towns did too). I thought I’d share this with you this Christmas. It was a good memory for me.” There wasn’t a lot of explanation, but the gratitude was there in his eyes. I could tell this was something special from his childhood. Once each of us were handed our bag, I removed the paper clip, and unfolded it to see the treasures inside. 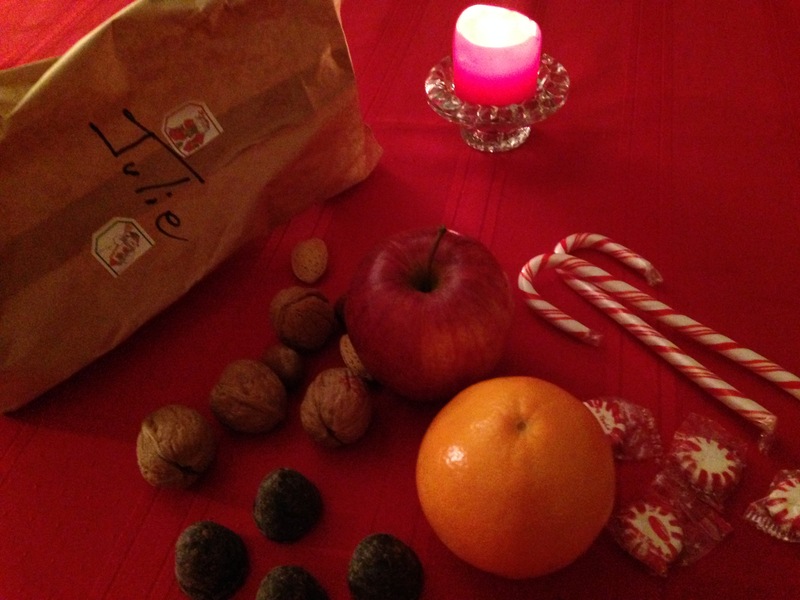 It contained an apple, an orange, a baggie of nuts still in their shells, a few peppermint candies, two candy canes and four chocolate haystack candies. If I tried to describe what I felt when I carefully laid everything out on the table, I wouldn’t be able to find the right words. I tried to imagine as a child receiving this gift on Christmas Eve and thinking how fortunate I must be for having so much. I wondered if I would be receiving any other gifts for Christmas. My Pop talked about getting one baseball for twelve kids to play with once a year. And it had to last all year until the next Christmas. When the threads popped, they wrapped it in duct tape. Same with shoes. One pair had to last the whole year, taping those from time to time. For my father, that gift was first given to him over 65 years ago. The experience (and many others from his days in Edwight, W.Va.) created a lasting impression on him. Without even saying a word that evening, I could tell that meant a lot to him, so much so that he wanted to share it with us. Saving the best gift for last, the gentle tone of his voice, and the distant look in his eyes for just a moment gave me a glimpse of the gratitude he had kept with him all these years. I also had the same feeling of gratitude for receiving not only the gift, but also the wisdom in the story that went along with it. So this gift, that most would shrug off today as a snack or even less than, may have been an entire Christmas for some children, and may still be even today for some. And they were grateful. It instilled in me a deeper appreciation, a deeper gratitude for not only the tangibles in life but life itself. Maybe it wasn’t so much what was inside that bag, but the mere fact that someone cared enough to give them a gift. That someone cared. Developing an attitude of gratitude isn’t’ just for the holidays, but every day. We live in a world where quick hits, catchy phrases, degrading others, thinking before we speak/write is not only “liked” but encouraged. Stop worrying about being noticed for what you say, and be more focused on being an example by what you do. Or better yet, just do your thing and be grateful. Julie, I remember these times also and we did have a wonderful Mom and Dad who loved us all very much and left footprints on each of our hearts.